According to scientists, a person has some five million scent receptors, which sounds like a lot until you realize that a bloodhound has 300 million receptors. Depending on the breed, a dog’s sense of smell is some 1,000 to 10,000,000 (our bloodhound) times more sensitive than its owner’s. There’s more. A dog’s brain is about one-tenth the size of a human brain but the part that relates to sense of smell is 40 times larger. Consequently, the trash can, candy dish, dropped food, pie left on the counter top, and the sandwich you stepped away from for a second to grab a drink all beckon and the call can be irresistible to many dogs. We’re looking at you Labrador Retrievers. 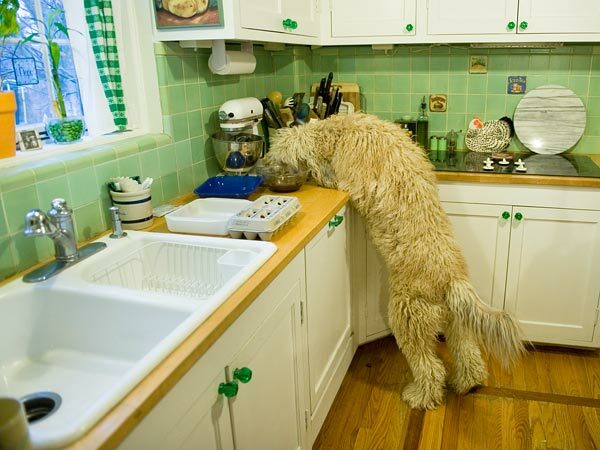 So if the wonderful aroma of a holiday feast being prepared makes you salivate, just imagine what it does to your dog. A small bite of most people food is not dangerous, but owners do need to be vigilant so that a trip to the veterinarian is not part of the season. This time of year with dinners, parties, visitors, holiday decorations, and general hustle and bustle can be particularly challenging for owners of adventurous pets. The food issue is two-fold: the sneak attack, and owner indulgence. Both can result in gastric distress from annoying to dangerous. In the sneak attack, a pet waits for the humans to be distracted with conversations, arriving guests, or football games. Any food within reach is fair game. The obvious solution is to keep pets and people food—from appetizers to leftovers—as far apart as possible. This includes disposing of the turkey carcass, bones, and other garbage or moldy food in containers that cannot be knocked over and opened. Owner indulgence is a very avoidable issue. While the holidays are reasons to celebrate with food, family, and friends, your dog’s proper diet should be a constant. Many owners will be tempted share the bounty of holiday goodies but the dog’s health should win out. Even if you are a responsible owner, a conversation may be necessary with kind-hearted grandmom who believes Dodger is too skinny. Fatty scraps like gravy, turkey or chicken skin, oily or greasy side dishes, other rich foods and dietary indiscretions can lead to severe digestive track issues. 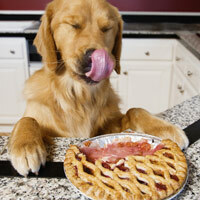 Even gravy or cooking juices poured over dry pet food can be a problem. A word about giving bones to dogs: “No.” No animal bones should be given as treats. Bones can splinter and very hard bones and antlers can fracture a pet’s teeth. Xylitol (sweetener used in baked goods and gum). A complete list available at American Animal Hospital Association’s Healthy Pet.com. Other concerns during the Christmas/ New Year’s holidays. Ensure pets cannot access possibly toxic tree water. Here’s a podcast from the American Veterinary Medical Association about protecting your pet during the holidays. If you do have a pet emergency during the holiday season and your veterinarian is not available, the NC State University Small Animal Emergency Service is here 24 hours a day, seven days a week. The location of the Terry Center is 1052 William Moore Drive near the intersection of Hillsborough and Blue Ridge in Raleigh, NC. Please call 919.513.6911 to inform clinicians of your pet’s emergency.